African Americans were faced with conflicting loyalties during the Revolutionary War, with some joining the British side in hopes of escaping from slavery, while many others remained loyal to the Patriot cause. While it's difficult to know the exact numbers, an army report in 1778 listed 755 African Americans serving in the Continental Army; the inclusion of those serving in state and local militias and in non-combat roles would undoubtedly make the total number of black Patriots much higher. Source | Jean Baptiste Antoine de Verger, American Foot Soldiers, Yorktown Campaign, watercolor, 1781, Anne S.K. Brown Military Collection, Brown University Library, http://dl.lib.brown.edu/catalog/catalog.php?verb=render&id=1228246188843750&colid=13. 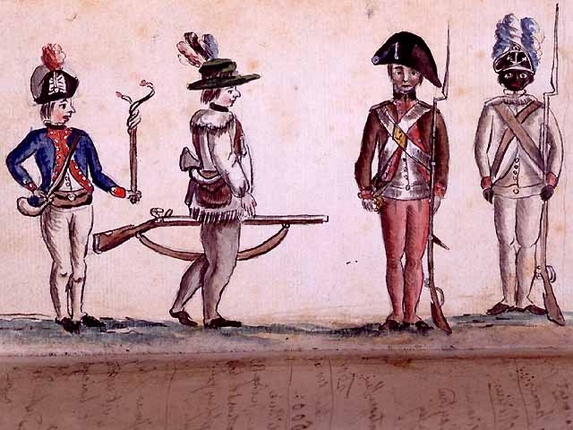 Cite This document | Jean Baptiste Antoine de Verger, “Soldiers in Uniform,” HERB: Resources for Teachers, accessed April 21, 2019, https://herb.ashp.cuny.edu/items/show/1209.